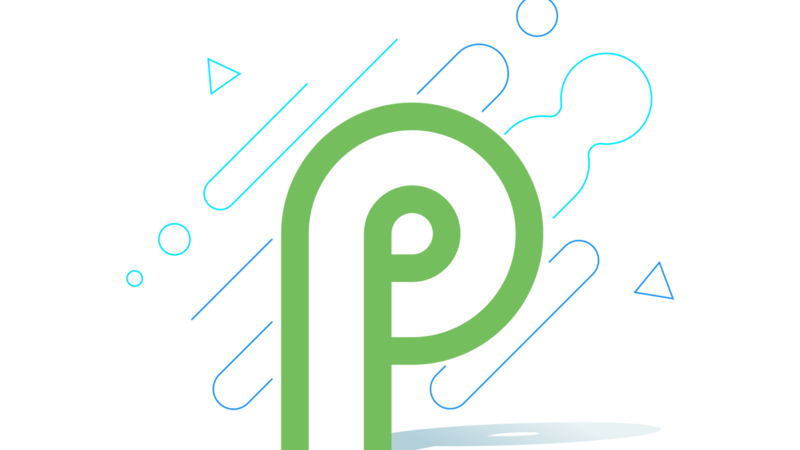 We have been getting a lot of rumors of the Android P and its features from past couple of months and today; Google made the first Android P developer preview official for all the Pixel phones. The developer preview comes with all the latest design changes and new features in the next version of Android, i.e., Android 9.0. 1 ANDROID P DEVELOPER PREVIEW – WHAT’S NEW? ANDROID P DEVELOPER PREVIEW – WHAT’S NEW? There are a lot of significant changes that have been made to the UI. First of all, the Notification panel is now entirely new. It is not like the one on Android Oreo that was just a little redesign of Android N’s notification panel. This time, each element has been changed. The notification panel on the Android P looks cleaner than the one of Android Oreo, as seen in the image above. 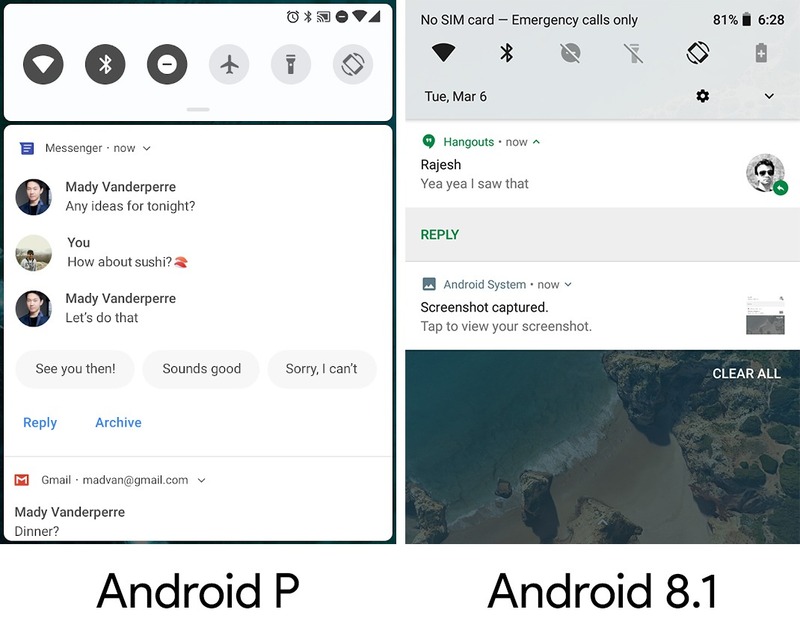 Keep in mind that the global release of Android P might not feature the same design for the notification panel as there could be some changes. There is a bar which can be pulled down to expand all the quick settings. Most of the users didn’t like the transparent notification panel of Android Oreo, so in Android P, there is a clean white background for the panel. Still, there are chances that it will turn black if a dark wallpaper is applied, just like on Android Oreo. But, we are sure that if it happens, then the background will be clear black instead of transparent black. 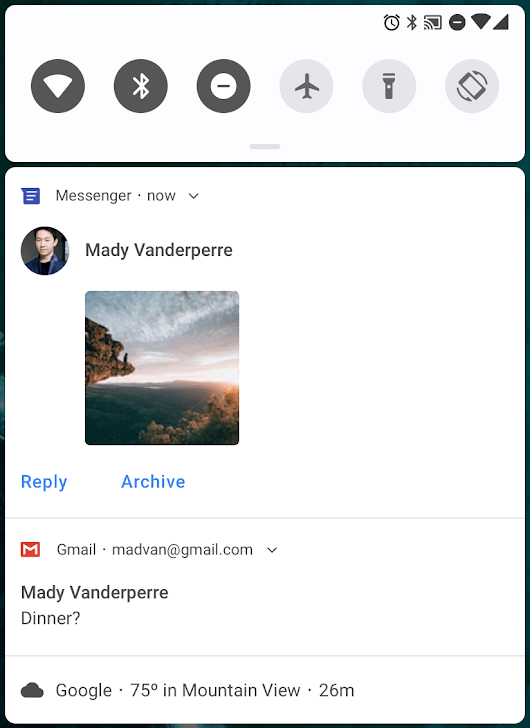 The Android P Developer Preview comes with improved messaging notifications. So, as seen in the images above, the user will not just be able to reply directly from the notification panel, but also see the previous message and even an image that has been sent in the previous message. You can attach photos and stickers, and even suggest smart replies. You knew it was coming, right? Well, it has been rumored from past month that Android P will come with notch support and the Android P Developer Preview 1 comes with the same. The status bar will automatically adjust the height so that the content can be viewed without any distraction. There is also an option to watch the content on the full screen, even with the notch in between. You can now access streams simultaneously from two or more physical cameras on devices running Android P. On devices with either dual-front or dual-back cameras, you can create innovative features not possible with just a single camera, such as seamless zoom, bokeh, and stereo vision. The API also lets you call a logical or fused camera stream that automatically switches between two or more cameras. We’re looking forward to seeing your new and exciting creations as Android P devices supporting multiple cameras reach the market in the year ahead. There are a ton of other features added to Android P like Neural Networks API 1.1, Autofill improvements, Open Mobile API for NFC payments and secure transactions, Data cost sensitivity in JobScheduler, HDR VP9 Video, HEIF image compression, and Media APIs, ImageDecoder for bitmaps and drawables, etc. To get the First Android P Developer Preview on your Pixel phone, all you have to do is download the system image that is available from the official site and flash it on your phone. Or, you canuse the OTA package to get the developer preview. 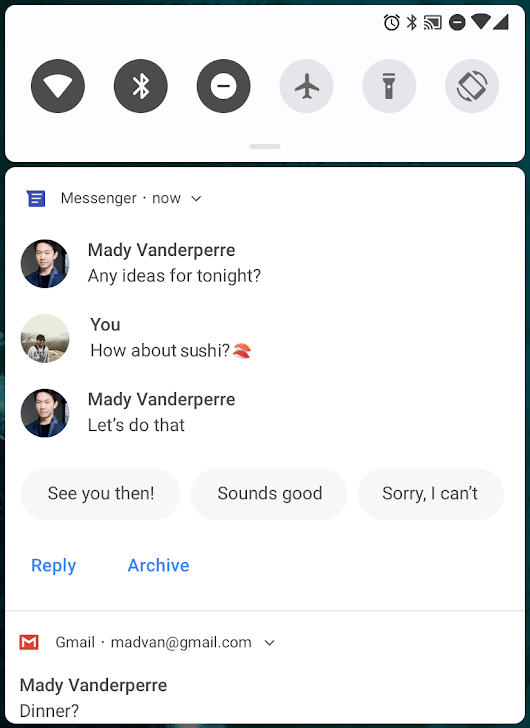 If you tried the new developer preview of Android P, do let us know the new changes in the design and the new features that you noticed.